For some people who do not believe in true love, Almi Ilagan and Kim Atienza will prove you wrong. From a high school crush, to young love and then to a long term relationship, Almi and Kim were indeed a match made in heaven. Last November 2012, they sealed the deal in the eyes of God and their loved ones at the San Guillermo Parish and Club Balai Isabel in Batangas. With a relationship that bs 15 years, a few paragraphs will not really be enough to capture Almi and Kim’s love story. The two of them met way back in high school through a common friend. Even if they were in different schools that did not deter Kim to pursue Almi. Twice, Almi rejected Kim’s proposal because she thought they were too young to be romantically involved. Come freshman year, Kim was still consistently pursuing Almi. Realizing that it was maybe the right time, Almi finally said “yes”. And to cut the story short, it was a beginning of a first love that truly will never die. Kim and Almi decided to go for a Vintage Beach wedding to show their appreciation for things getting old beautifully (like their now more than 11-year-old relationship) and the value of keeping things until they are old (like their love for each other). They also chose a beach theme for their wedding reception even if their wedding was held by a lake. Their wedding colors were muted shades of sea foam blue, mint green, and salmon pink. To make the wedding very Almi and Kim, the couple were a hundred percent hands on with their Batangas wedding preparations . Their DIY wedding projects feature lace, burlap, jute strings, and vintage artworks. They made paper sailboats as place cards. They had two wooden boat carvings that served as the drinks station during the cocktail hour. Stringed seashells were used to make boutonnieres and wrist corsages for the principal sponsors, headpieces for the bride, maid of honor and flower girls, and cord for the ceremony. The flower girls carried pink tin pails with white flowers instead of the usual flower baskets; while the ring and coin bearers carried heart-shaped boxes in vintage design instead of the usual pillows. They also used free printable wedding invitation designsthat were available online. Even the sparkler holders were customized. But Kim and Almi could not do it all on their own so they sought the help of well-picked wedding suppliers. They did a lot of research (websites, forms, wedding expos and personal interviews) before they finally decided on each. 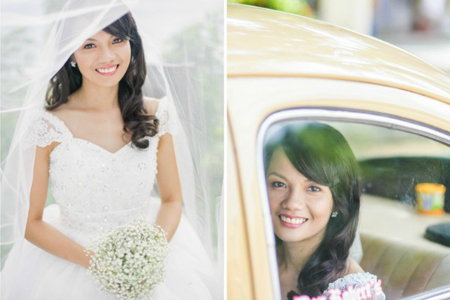 The two main factors they considered were the quality of their previous work and of course, their Batangas destination wedding budget. They were really also very grateful to their wedding suppliers like V-Gem Jewelry, who provided them with their thumb-printed wedding rings and Don Roberts Bridal Cars, who provided them with a Beetle for their bridal transport. 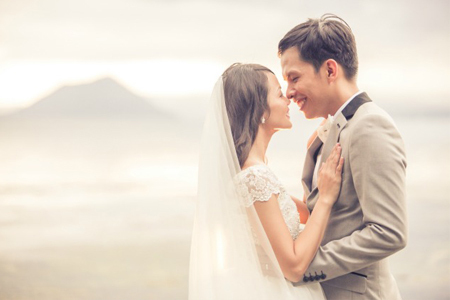 The beautiful DIY Vintage Beach Wedding of Almi and Kim is truly an inspiring one. For these newlyweds, first love will indeed never die but continue to grow just as it was destined to be.